What's going to happen to our daughter? How do I tell my husband? I desperately wanted the doctor's words to be wrong. I wanted to do a delete of the last six hours and return to our normal, slightly chaotic life as a family of six. But we don't live in a fantasy world. This was reality. I had just been told that our three year old child had a mass in her brain. I want this all to go away. I can't believe this is happening to us. I'm frightened. Perhaps you've had thoughts similar to these during a tough time in your life. Or you could be thinking them right now. Fear, pain, anger and grief may be consuming you. I have felt these emotions many times during our journey of having a child with a brain tumour and its ongoing implications. Fear of what could happen to our child and how we as a family would make it through; the pain of witnessing a child who was seemingly healthy suddenly become physically disabled, requiring hours of rehabilitation; Anger, asking why did this happen to our child? And the grief of witnessing a childhood that was no longer carefree. But alongside these emotions there has also been perseverance, faith, hope and love. Perseverance to do all that was possible to help our child physically and emotionally; A rising faith, although wavering at times, faith to believe that there is a God in Heaven who is on our side; Increasing hope in a God who has a plan that is good; Learning to receive love, the love of family, friends, church family, school community, neighbours and the love of strangers through charities. But most importantly the love of Jesus Christ, who laid down His life for us so we could confidently declare Romans 8:37, Yet in all these things we are more than conquerors through Him who loved us (NKJV). This book chronologically covers the first three years of our journey of having a child with a brain tumour. During that time, I as the mother, have learned much including strategies to help care for the emotional and physical needs of a child on chemotherapy, and who also has hemiplegia (left side weakness); as well as strategies to overcome the mental health strain of being a primary carer; and to maintain a marriage and care for the emotional well-being of our other three children. None of this we have done perfectly, but we have by the grace of God, made it through to the other side with our family still together! At the end of each chapter there is a reflection in which I have endeavoured to explain these strategies along with examples of how we implemented them. In the appendices I have included the practical checklists I created for our family and those who lovingly came to help in our home. These checklists enabled us to keep some sense of order in the chaos. If you've found yourself on a similar journey to us, my prayer is that the inclusion of these practical strategies and checklists will be of great benefit to you and your family. Finally, as you read our story, I pray that you will be encouraged to persevere despite the fear, pain, anger and grief. And that you will be inspired to grow in faith and hope, and fully receive the love offered to you by other people and Jesus Christ. "Victoria Grace" is also a very well written story of human strength and resilience - I couldn't put it down even though I knew the story. Thank you Wendy for providing so much meaningful assistance to other parents, extended family and support networks!" Linda Brown, Senior Social Worker - Redkite (Redkite, an Australian cancer charity providing essential support to children and young people (0-24 years) with cancer, and the family and support network who care for them). 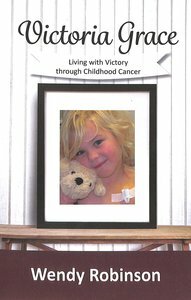 About "Victoria Grace: Living With Victory Through Childhood Cancer"